Murad IV (Ottoman Turkish: مراد رابع‎, Murād-ı Rābiʿ; 26/27 July 1612 – 8 February 1640) was the Sultan of the Ottoman Empire from 1623 to 1640, known both for restoring the authority of the state and for the brutality of his methods. Murad IV was born in Istanbul, the son of Sultan Ahmed I (r. 1603–17) and Kösem Sultan. He was brought to power by a palace conspiracy in 1623, and he succeeded his uncle Mustafa I (r. 1617–18, 1622–23). He was only 11 when he ascended the throne. His reign is most notable for the Ottoman–Safavid War (1623–39), of which the outcome would permanently part the Caucasus between the two Imperial powers for around two centuries, while it also roughly laid the foundation for the current Turkey–Iran–Iraq borders. Murad IV was for a long time under the control of his relatives and during his early years as Sultan, his mother, Kösem Sultan, essentially ruled through him. The Empire fell into anarchy; the Safavid Empire invaded Iraq almost immediately, Northern Anatolia erupted in revolts, and in 1631 the Janissaries stormed the palace and killed the Grand Vizier, among others. Murad IV feared suffering the fate of his elder brother, Osman II (1618–22), and decided to assert his power. At the age of 16 in 1628, he had his brother-in-law (his sister Fatma Sultan's husband, who was also the former governor of Egypt), Kara Mustafa Pasha, executed for a claimed action "against the law of God". Murad IV tried to quell the corruption that had grown during the reigns of previous Sultans, and that had not been checked while his mother was ruling through proxy. Murad IV banned alcohol, tobacco, and coffee in Istanbul. He ordered execution for breaking this ban. He would reportedly patrol the streets and the lowest taverns of Istanbul in civilian clothes at night, policing the enforcement of his command by casting off his disguise on the spot and beheading the offender with his own hands. Rivaling the exploits of Selim the Grim, he would sit in a kiosk by the water near his Seraglio Palace and shoot arrows at any passerby or boatman who rowed too close to his imperial compound, seemingly for sport. He restored the judicial regulations by very strict punishments, including execution, he once strangled a grand vizier for the reason that the official had beaten his mother-in-law. Murad IV's reign is most notable for the Ottoman–Safavid War (1623–39) against Persia (today Iran) in which Ottoman forces managed to conquer Azerbaijan, occupying Tabriz, Hamadan, and capturing Baghdad in 1638. The Treaty of Zuhab that followed the war generally reconfirmed the borders as agreed by the Peace of Amasya, with Eastern Armenia, Eastern Georgia, Azerbaijan, and Dagestan staying Persian, while Western Armenia, and Western Georgia stayed Ottoman. Mesopotamia was irrevocably lost for the Persians. The borders fixed as a result of the war, are more or less the same as the present border line between Turkey, Iraq and Iran. During the siege of Baghdad in 1638, the city held out for forty days but was compelled to surrender. Murad IV himself commanded the Ottoman army in the last years of the war. While he was encamped in Baghdad, Murad IV is known to have met ambassadors of the Mughal Emperor Shah Jahan, Mir Zarif and Mir Baraka, who presented 1000 pieces of finely embroidered cloth and even armor. Murad IV gave them the finest weapons, saddles and Kaftans and ordered his forces to accompany the Mughals to the port of Basra, where they set sail to Thatta and finally Surat. Murad IV put emphasis on architecture and in his period many monuments were erected. The Baghdad Kiosk, built in 1635, and the Revan Kiosk, built in 1638 in Yerevan, were both built in the local styles. Some of the others include the Kavak Sarayı pavilion; the Meydanı Mosque; the Bayram Pasha Dervish Lodge, Tomb, Fountain, and Primary School; and the Şerafettin Mosque in Konya. Very little is known about the concubines of Murad IV, principally because he did not leave sons who survived his death to reach the throne, but many historians consider Ayşe Sultan as his only consort until the very end of Murad's seventeen-year reign, when a second Haseki appeared in the records. It is possible that Murad had only a single concubine until the advent of the second, or that he had a number of concubines but singled out only two as Haseki. Another consort of his may have been Sanavber Hatun, though certainly not of the Haseki rank, whose name can be found on the deed of a charitable foundation as "Sanavber bint Abdülmennan"
Rukiye Sultan (died 1696, buried in Ahmed I Mausoleum, Blue Mosque, Istanbul), married firstly 1663, Şeytan Divrikli Ibrahim Pasha, Vizier, married secondly 1693 Gürcü Mehmed Pasha. 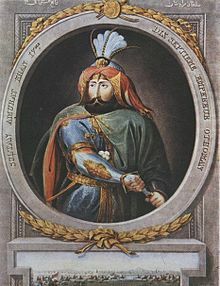 Murad IV died from cirrhosis in Istanbul at the age of 27 in 1640. Rumours had circulated that on his deathbed, Murad IV ordered the execution of his mentally disabled brother, Ibrahim (reigned 1640–48), which would have meant the end of the Ottoman line. However, the order was not carried out. In the TV series Muhteşem Yüzyıl: Kösem, Murad IV is portrayed by Cağan Efe Ak as a child, and Metin Akdülger as Sultan. ^ Accounts and Extracts of the Manuscripts in the Library of the King of France. 2. R. Faulder. 1789. p. 51. The sultan Morad put him to death in the year 1037 [AH], for some action which was contrary to the law of God. ^ Hopkins, Kate (2006-03-24). "Food Stories: The Sultan's Coffee Prohibition". Archived from the original on 20 November 2012. Retrieved 2006-09-12. ^ Hari, Johann (2015). Chasing the Scream: The First and Last Days of the War on Drugs. Bloomsbury USA. p. 262. ISBN 1620408902. ^ a b c Davis, William (1922). A Short History of the Far East. The Macmillan Company. pp. 259–260. ^ McCullagh, Francis (1910). The Fall of Abd-ul-Hamid. London: Methuen & Co. Ltd. p. 72. ^ İnalcık, Halil; Imber, Colin (1989). The Ottoman Empire : the classical age, 1300-1600. New Rochelle, N.Y.: Aristide D. Caratzas. p. 99. ISBN 0-89241-388-3. ^ Traian Stoianovich (1 January 1994). Balkan Worlds: The First and Last Europe. M.E. Sharpe. p. 57. ISBN 978-0-7656-3851-9. ^ "Genocide and the Modern Age: Etiology and Case Studies of Mass Death". Retrieved 2014-12-30. ^ Farooqi, N. R. (1989). Mughal-Ottoman relations: a study of political & diplomatic relations between Mughal India and the Ottoman Empire, 1556-1748. Idarah-i Adabiyat-i Delli. Retrieved 2015-06-14. ^ Artan, Tülay (2008). "Questions of Ottoman Identity and Architectural History". In Arnold, Dana; et al. Rethinking Architectural Historiography. London: Routledge. pp. 85–109, page 98. ISBN 978-0-415-36082-1. ^ Müller-Wiener, Wolfgang (1988). "Das Kavak Sarayı Ein verlorenes Baudenkmal Istanbuls". Istanbuler Mitteilungen. 38: 363–376. ^ Leslie P. Peirce (1993). The Imperial Harem: Women and Sovereignty in the Ottoman Empire. Oxford University Press. pp. 107–108. ISBN 978-0-19-508677-5. ^ a b c d Hafiz Hueseyin Ayvansaray-i (2000). The Garden of the Mosques: Hafiz Hüseyin Al-Ayvansarayî's Guide to the Muslim Monuments of Ottoman Istanbul. Brill. pp. 10, 25. ISBN 978-9-004-11242-1. ^ a b c Mustafa Çağatay Uluçay (2011). Padişahların kadınları ve kızları. Ankara, Ötüken. pp. 80–90. ^ Murphey, Rhoads (January 1, 2007). Studies on Ottoman Society and Culture, 16th-18th Centuries. Ashgate Publishing Company. p. 214. ISBN 978-0-7546-5931-0. ^ Barber, Noel (1973). The Sultans. New York: Simon and Schuster. p. 87. ^ "Muhteşem Yüzyıl Kösem'in 4. Murad'ı Metin Akdülger kimdir?" (in Turkish). Retrieved 2017-11-06. Roemer, H. R. (1986). "The Safavid Period". The Cambridge History of Iran: The Timurid and Safavid Periods. VI. Cambridge: Cambridge University Press. pp. 189–350. ISBN 0521200946. Sakaoğlu, Necdet (2008). Bu mülkün kadın sultanları: Vâlide sultanlar, hâtunlar, hasekiler, kadınefendiler, sultanefendiler. Oğlak Yayıncılık. p. 303.